Read more on our Heritage Month Guide. In 1963, Betty Friedan ushered in the "Second Wave" of feminism with her book, The Feminine Mistique. She captured the growing dissatisfaction of women as homemakers in postwar suburban America. Her work was one of the forces leading to the women's liberation movement of the late 1960s, reminiscent of the campaigns for women's suffrage in the early 1900s. Friedan founded or co-founded a number of women's organizations including NOW (National Organization for Women, 1966), NARAL (National Association for the Repeal of Abortion Laws), and NWPC (National Women's Political Caucus) to increase women's participationin the political process. This is the beginning of a three-day celebration of the Chinese New Year, although traditionally the New Year celebration extends for fifteen days until the Lantern Festival. The festivities mark the beginning of year 4717 (The Year of the Pig) since the mythical founding of the Chinese people. On New Year's Eve, the Kitchen God returns from heaven to the shrine prepared by each family, where he is welcomed back with firecrackers and offerings. New Year's Day is a day when all business accounts are settled and grudges forgotten. Traditional Chinese celebrate New Year's Day as a birthday and count themselves one year older. Commemorates the birth of Abraham Lincoln, one of the greatest presidents of the United States, who changed the course of history by preserving the American Union during the Civil War, thereby preserving American democracy. Lincoln issued the historic Emancipation Proclamation, which evolved to become the Thirteenth Amendment to the U.S. Constitution ending slavery in the United States. "Whenever I hear anyone arguing for slavery I feel a strong impulse to see it tried on him personally" (from an 1865 speech). An abolitionist, Jones and his friend Richard Allen, walked out along with the other Black members when Philadelphia's interracial St. George's Methodist Church voted that Blacks must be segregated to the balcony in 1786. A year later, Jones and Allen founded the Free African Society, helping newly freed Blacks adjust to urban life, advocated against slavery, founded schools, and lobbied before Congress for the repeal of the Fugitive Slave Act. Jones and Allen established the first Black church in Philadelphia, the African Episcopal Church of St. Thomas in 1792, where Jones became the first Black priest in America. Jones died on this date. Frederick Augustus Bailey escaped slavery at the age of 21, changed his name, and became a renowned campaigner for the abolition of slavery. He published his autobiography in 1845, after which he gave lectures on a tour of England where friends raised money to buy his freedom. Returning to the United States, he founded a newspaper, the North Star and urged President Lincoln to free the slaves and arm African Americans during the Civil War. After the war Douglass held a variety of federal offices. Birthday of George Washington (1732-1799), hero of the Revolutionary War, president of the Constitutional Convention, and first president of the United States of America, is observed on this day. His Birthday became an official federal holiday in 1885. As a number of states also celebrated the February 12 birthday of Abraham Lincoln, some legislators advocated combining the two holidays into a single holiday called Presidents' Day. That proposal was rejected by Congress and the official name of the holiday remained Washington's Birthday. German and Afro-Dutch women. She founded a sisterhood in South Africa and started Women of Color Press. She won the American Book Award in 1989 for A Burst of Light. She succombed to breast cancer in 1992, but not before chronicling her 14 year battle with the disease in such works as The Cancer Journals. A scholar, writer, and editor, Du Bois proved to be the most important leader of the effort to secure basic civil and human rights for African Americans in the first half of the twentieth century. He wrote a number of scholarly works about the social conditions of Blacks in America, the the most famous, The Souls of Black Folk, attacked Booker T. Washington's strategy of accommodation and urged a more activist approach to improve the conditions of Black Americans. He founded the Niagara Movement in 1905 (Black intellectuals working for civil rights), and helped found the National Association for the Advancement of Colored People in 1909. He resigned from the NAACP in 1934 to devote his time to teaching and writing. The entries for this calendar have been adapted from the Electronic Diversity Calendar (TM). Used with permission. For more information about the calendar and how to license it for your employees, please visit here. For more about the calendar, please visit here. 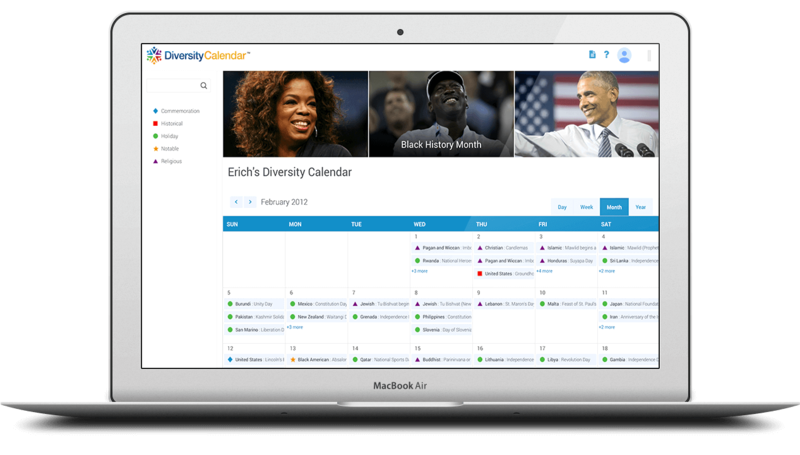 The 2019 - 2020 electronic calendar offers 12-months of the most comprehensive multicultural available with over 1,500 entries and 20+ Monthly Diversity Themes. Discover how multicultural holidays and events are celebrated complete with recipes of key foods and audio pronunciation in various languages. New features include colorful imagery, engaging videos of selected entries -- watch a Chinese Lantern Festival, listen to songs of a Muslim EID, or observe a Native American Heritage cultural celebration. The calendar has a powerful search engine to quickly find all entries on a particular subject. Put this extraordinary resource at the fingertips of all your employees. Prices available for small, medium, and large companies and organizations. The more users you have, the more economical the cost! As low as $1.00 or less per employee per year. A great, cost effective way to build awareness about diversity and inclusion 365 days a year! Request a Quote and Informative PowerPoint Presenation Fact Sheet or call 206.362.0336. REQUEST YOUR QUOTE TODAY!